Keene highbankers are a great place to start for those thinking of their first power sluice. Classification is the name of the game when it comes to fine gold recovery. By screening the large rocks away it is possible to get enhanced fine gold recovery with a properly operated power sluice. These units are relatively affordable and easily transported but large enough to move enough gravel to get some gold. Two people can be kept busy shoveling gold bearing material into the hopper. 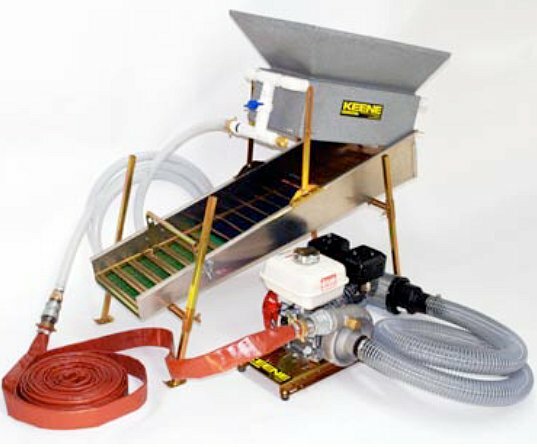 This unit can be converted to a 2.5" or 3" bank mounted suction dredge with optional hoses and nozzle.